I collect airports. Not as in so-rich-I-can-buy-them, but as in so many strange adventures in them. My first-ever jet flight was to California to visit friends, who arranged for us to take a side trip to Las Vegas, so buy the time we returned home I was a veteran of 6 different plane trips. It didn’t take me long to discover that I love flying. I’ve always been intrigued by airplanes – the magic of how these huge machines can get in the air, and the speed of takeoff. When I was 16 I cadged a ride on a small prop plane – a 4-seater twin-engine Cessna. A Hamilton company had brought several of their small planes to a local air show for display, and I was there working in a Kiwanis food booth. I found a kindred spirit in one of my co-workers, and because our booth was the farthest out and had little business, we had some time to check out the planes. The organizers closed our booth for the Sunday of the air show, but we still had our passes to get in, so we both returned on Sunday and chatted up some of the pilots for the aircraft company, who offered to let us fly with them to Hamilton and back as they returned all the small planes to their home base. It was the most exciting thing I’d ever done to that point. We even got to help pull the planes from the grass to the airstrip – we felt very cool! That adventure stayed with me for many years, and was perhaps my real introduction to making my bucket list dreams come true (although the ‘bucket list’ concept wouldn’t make an appearance for another 34 years. After our trip to California, the next flying adventure that my hubby and I shared was on our honeymoon, and that really was an adventure. We flew the now-defunct Eastern Airlines from Buffalo to Puerto Rico, where we had a connecting flight on another now-defunct airline, Prinair. Prinair was a small island-hopper service that at the time was the main access to the Caribbean islands. The flight to Puerto Rico was fine, but as we waited in line to board the final leg from there to St. Thomas, we could hear a businessman behind us talking about how many times Prinair had crashed in the ocean. When we boarded the plane, a small 18-seater with just 2 rows, we both noticed that the door to the cockpit was shaped a fair bit like a casket. After everyone was aboard, our pilot seemed to be channeling Mario Andretti – he taxied to the main runway, we’re guessing looked both ways quickly, gunned the engines, turned onto the runway and lifted off without any preamble. By now we’d started to laugh hysterically. I became quiet, though, when partway into the flight I looked out at the wing on my side and noticed that not only were all the bolts in the housing rattling around but some were missing entirely. My newly-pronounced hubby noticed my lack of conversation and finally coaxed out what was bothering me. He tried to reassure me, but we were both intensely relieved when we started our approach to St. Thomas. Great view out the window of the magnificent blue-green waters surrounding the island, but because St. Thomas is essentially just a mountain in the Caribbean, like a slightly melted giant chocolate chip, the plane then had to land quickly and jam on the brakes before we drove into the mountainside. I came very close to kissing the ground when we disembarked. Since then we’ve had all kinds of interesting departures and landings around the world. We probably had the most concentrated amount of fun when we visited Southeast Asia in 1994. Our first stop was Hong Kong when the original airport was still in use. The landings at Kai Tak were also onto short runways, so jumbo jets had to skate in just over the roof tops – we could wave to people hanging out their laundry – before touching down and jamming on the brakes. Leaving from there to Bangkok was equally entertaining: we walked out of the hangar to board a shuttle bus, which then proceeded to drive around for 45 minutes looking for our plane amongst a bunch of airplanes parked together like cars. The driver would pull up to an aircraft, look at the number on it, shake his head and move on. We started laughing hysterically for that one too. 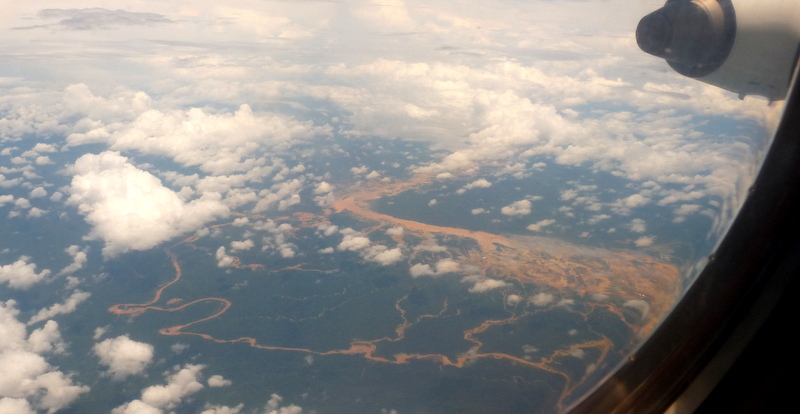 On our approach to Singapore, in the ‘welcome’ announcements by the flight attendant, she finished off by telling us that in Singapore the penalty for smuggling drugs is Death. Alrighty then! We didn’t see anyone make a mad dash to the washroom before landing though. Our landing in Jogjakarta was the most fun of all. There was a single runway that we rolled up and down along like a low-level rollercoaster. The arrivals building was essentially a large shed with a rectangular hole in the wall, through which the baggage handlers tossed luggage onto about a 6-ft long belt that spit the suitcases off onto the floor where we were all standing around waiting. Thank goodness all our souvenirs were well wrapped! Africa has long been a challenge – flights funnel into just a handful of main hubs. For our first safari, to Botswana in 2007, we spent about 2 days getting there, with an 11-hour layover in London, England before a 10-hour flight to Johannesburg and then a 2-hour flight to Maun in Botswana. 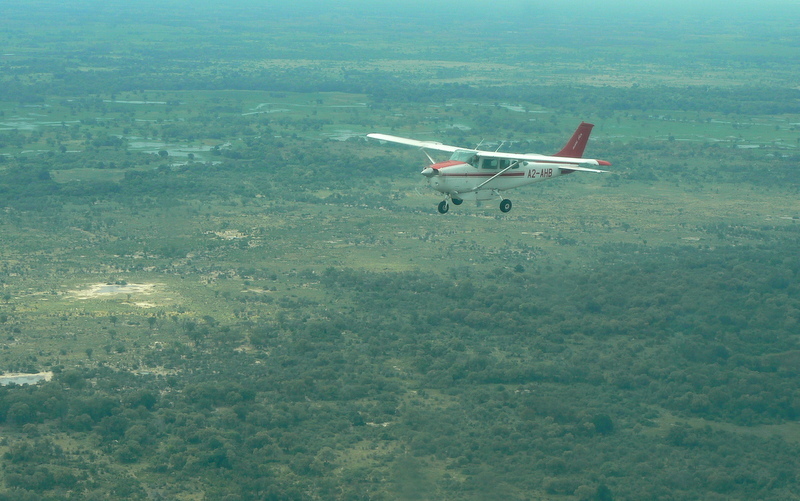 From there it turned into a real African adventure as we boarded small bush-planes to reach our first 2 safari camps in the Okavango Delta, which could only be reached by air. The bush planes chug along at about 1,000 feet, sometimes feeling like they aren’t moving at all, but you can watch the African landscape unfold below you as you go, sometimes catching glimpses of elephants or giraffes for your first introduction to the wonderful wildlife you’ll soon be getting much closer to. When Mike and I planned that safari, we originally wanted to visit Botswana and Tanzania, but it was next to impossible to travel between the 2 countries without a great deal of complicated maneuvering as well as lots of extra time and/or money. Now, however, a low-cost carrier based in Tanzania, fastjet, is introducing ‘international’ flights to several other countries in Africa. This is momentous news in the world of safari planning because people will finally be able to get from southern Africa to eastern Africa relatively easily. Visitors will be able to fly between Dar es Salaam and either Johannesburg in South Africa or Lusaka in Zambia for fares are expected to start at only around $100US, opening up lots of new options for safari enthusiasts. Guess that means Mike and I will just have to go back to Africa once again to check them out!